It started when she bought a shipping container and turned it into a pop-up art space. 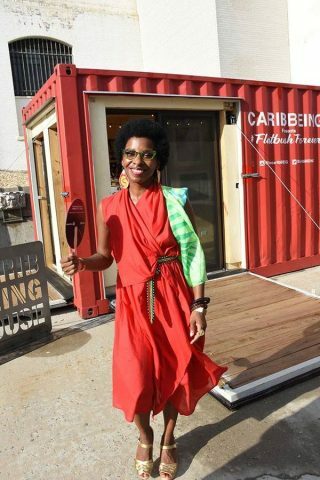 Shelley Worrell is the Founder and CEO of CaribBEING, a non-profit and cultural space that celebrates Caribbean heritage, in the rapidly gentrifying neighborhood of Flatbush, Brooklyn. It’s not a store or shop; it is a “miniaturized mobile museum,â€ as Shelley puts it. Â Sitting inside the Tea Room at the Flatbush Caton Market,Â Worrell sits poised, with her hair perfectly coifed in a curly fro and crimson red lipstick. Â Her demeanor echoes her Google executive past with a laid back vibe that is influenced by her new surroundings. It wasn’t too long ago thatÂ Worrell worked as a Strategic Partner Development Manager at Google, but decided that she needed to spend more time with family. Thus, she developed CaribBEING to what it is today. Now, Worrell is in charge of making visitors feel like they are transported to the Caribbean. Every inch of the container, including the repurposed windows, mimics the feel of a breezy, beachside bar. Â The plywood and bespoke floors are made out of oak and were designed and installed by an interior architect. The custom designed tropical rainforest wallpaper was installed by an artist. Â To top it off, a falling door concept was conceived by the lead architect in Berlin, Germany. WorrellÂ has masterfully blended her Google work ethic and business strategy to make CaribBEING a one-of-a-kind business, supporting her lifestyle and needs for connecting to her Trinidadian roots. She realizes that it takes a certain kind of finesse to run a business, which some people are seeing for the first time. Here are several strategies she used to make her transition from Google to becoming her own global brand. It’s a shipping container–that travels. 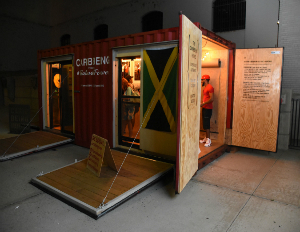 Â Part of the funding for the shipping container was made possible by a corporate partnership with Airbnb, which was an early supporter of the project, co-hosting three events with CaribBEING as part of this collaboration. Â The container itself was $2,000, but with customization, came out between $20,000-$25,000 to turn it into a piece of real estate. “To have your own, owned and operated space where you don’t have to wait for someone to invite you to an exhibition or a program, [means] you can have a program on demand,â€ Worrell says. No dreadlock photos here! Worrell describes the CaribBEING brand as authentic. “We have a very significant culture and piece to contribute to that conversation. I think that, at CaribBEING, we’re curators or stewards of that. One of the things we try to do is give voice to our culture in an authentic and meaningful way,â€ she says. Worrell is determined to make CaribBEING and Caribbean culture part of global speak, with wordsÂ like “afropolitanâ€ and “Caribpolitan.â€ Worrell explains that Caribpolitan is someone who is born from Caribbean parents, is usually a first generation, and has a strong Caribbean experience in the home, from the food they eat to the traditions they follow. However, there’s a twist. “You also couple that with going out in the world and into these large cities, such as New York, Paris, Miami, Toronto and Montreal. We feel like that is a very unique identity, because we have that city flavor that is also mixed with the Caribbean.â€ Rihanna and Nicki Minaj are prime examples of Caribbean women that have infused global influences into their style and self-expression. Hashtags like #caribbeing are everywhere on social media, and more are cropping up as young people continue to identify more with their Caribbean culture. To create and build upon an idea that has aÂ lasting impact, it can’t be done alone on an island. One of the thingsÂ Worrell attributes her success to is the partnerships and brand collaborations, if—and only if—they do not duplicate her efforts.Worrell evaluates every request to make sure it advances the CaribBEING mission and benefits both parties. She wants more startup businesses, particularly those in the Caribbean space, to see that. “Oftentimes, when you’re junior and you’re starting up, you might feel like, ‘Hey, I’m a makeup brand, so I should partner with another makeup brand.’ Probably not. Maybe you should partner with a fashion brand or makeup artist [instead],â€ she says. With strong partnerships and a growing social media following, Worrell is looking forward to CaribBEING’s future. Moreover, she owns a piece of real estate in a part of Flatbush, Brooklyn that is changing every day, due to gentrification. But Worrell doesn’t see that as a deterrent. She says CaribBEING appeals to both demographics and sees it being a communal space, no matter one’s age or background. “We’re cool enough,â€ she says–and she’s right. In the middle of a busy corner is a bright, red container. And woman at the center of it all is known by more than just her name, Shelly Worrell. “Sometimes, people call me ‘I AM CARIBBEING,'” she says. Maryann Reid is the digital managing editor of BlackEnterprise.com and the author of several books published by St. Martin’s Press. For more, please follow her @RealAlphanista.